Video Production on The Treasure Coast by Concepts Media Company. CMC’s services include business commercials and social media marketing with video. Creating originally creative and engaging videos is the best way to convey your business and brand, for local small businesses, video provides the best opportunity to promote a service or product. 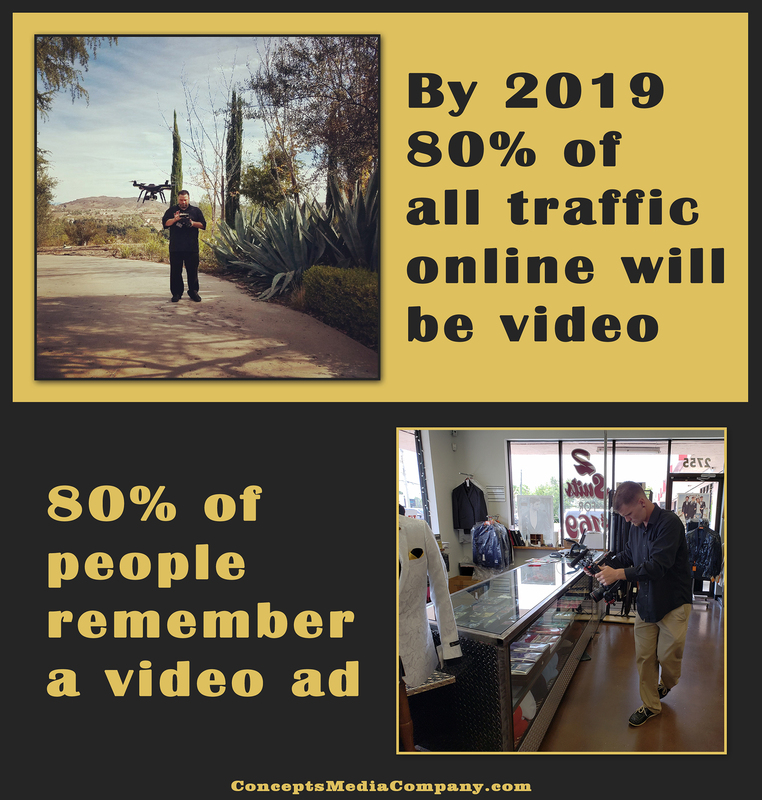 Video has become the most effective way of marketing a business or product online, with over 80% of all online traffic expected to come from video in 2019. That means the time is now to establish a video marketing campaign and we can help you with that. With video production by CMC, we will create a video campaign that works best for your type of business and your type of customers. You tell us the keywords you want to be known for the main services or products your company provides and we will custom tailor a video production package and with social media marketing you can get your business in front of the millions of social media users. Video is the best way to inform and entertain, today 8 out of 10 people remember a video ad, no other form of marketing even comes close to video. Concepts Media Company will create an original video that can engage with your customer base. With a business commercial from CMC, we will start with a meeting to get to know your business, your brand, and what drives you customer base. From that meeting we will draw up a storyboard for you to approve, once we get approval we will create a shot list and set a date for filming. Once we have filmed every shot needed we will go back to our studio and the editing process will begin. CMC will edit an engaging video that is sure to gain the attention you want. We will build a unique video campaign and come back to your business each month to create a new video, to stay on a consistent video campaign is the only way to build a strong loyal following. Posting the videos on your website, and sharing to social media networks will bring your customer base from Facebook, Twitter, Instagram, and Youtube back to your website. To gain the most attention for your video we will boost your video to the best demographics in your local area, attracting thousands of new viewers each week by promoting your video campaign. Depending on the social media marketing package you choose, we can place your video in front of 1,500 to 5,000 new potential customers in your specific demographics each week. Get your message heard by investing in video production and marketing with social media, call today and find out how Concepts Media Company can help. Find out more about marketing your business with social media on The Treasure Coast of Florida. Video production by Concepts Media Company servicing Stuart, Port Saint Lucie, and the Palm Beaches. Contact Concepts Media Company For all strategic social media marketing options and video production located in Port Saint Lucie, Fl. Reader will retain 80% of a message when they watch it in a video, that’s compared to only 10% when reading it. Users spend 88% more time on a website when it has video on the homepage. Around 50% of all internet users look for videos when shopping for a product or service before visiting a location. Placing your video on your websites homepage will increase your businesses chances of getting on the first page of Google by 53%. More than 5 billion videos watched daily on Youtube.